Carbon Monoxide is the #1 cause of poisonings in the U.S. Yet less than 5% of all CO Poisonings are reported! The safe and efficient operation of your heating equipment and other combustion appliances cannot be determined without testing using a calibrated combustion analyzer. Because the technology, instruments and training to do this testing correctly has only been available for a few years, odds are it's never been done. Your service technician should be certified to properly test and diagnose potential CO exposure. Carbon monoxide, even in small quantities can cause serious health problems, particularly in children and the elderly. Millions of unsuspecting homeowners are exposed to low levels of CO and don't even know it. Unfortunately U.L. Listed CO alarms don't go off until your family has been exposed to 70ppm (parts per million) for over 3-1/2 hours! Most international limits for unsafe levels, including OSHA and the World Health Organization's guidelines are between at 15-35 ppm. Carbon monoxide can come from additional sources in your home besides your heating equipment, and they should be checked. These sources include your Water Heater, Gas Range, Gas Logs, Space Heater, and Boiler - even an attached garage. Anytime equipment is installed, it's being exposed to conditions in which it has never been tested to perform. Venting systems, combustion air, duct systems, additional appliances in the building, building pressure etc., can all affect its operation. Besides that, after leaving the factory it's likely your equipment has been loaded and unloaded on trucks and transported several times. Vibration and shock can cause components to shift and move. The only way to truly know if your new equipment is operating safely and efficiently is to test it once it's been installed. levels are present. When working on the equipment, he will likely drill a hole in the flue of the appliance, and insert the probe of an electronic combustion analyzer to check actual burner performance. Additional performance testing might require holes to be drilled into the ductwork as well. Once he's finished testing he should provide documentation and review his results with you. What Should I Expect from my Heating Contractor? As a consumer you should expect your contractor to be trained in current technology that makes sure you're heating system is safe, comfortable and efficient. These are probably things you may expect are mandatory, but unfortunately they're not. The number one benefit of having an NCI Certified CO/Combustion Analyst test your home and appliances for carbon monoxide is his extensive training and knowledge. Your contractor should be trained to measure the safety and efficiency of all your combustion equipment, even appliances that he doesn't normally sell or service. Thorough testing can also verify that your equipment is operating at peak efficiency and provide the lowest operating costs. Finally, he should provide you with documentation that explains what he has found and what corrections have been or need to be performed. He should also provide you with material to better educate you about carbon monoxide sources and health effects. 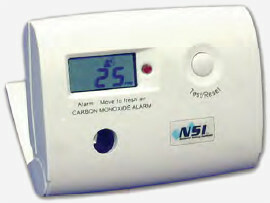 Protect Your Entire Family With NSI's Professional Grade Low-Level Carbon Monoxide Monitor. Provides protection for all age groups and conditions, especially infants, children, the elderly, and highly sensitive or ill people. Other detectors barely provide minimal protection for healthy adults. Lets you know there's a problem before reaching dangerous, even deadly CO levels, long before the other detectors even begin to work. NSI's Model 3000 Monitors employ the same electrochemical sensor technology found in professional CO Analyzers that cost thousands of dollars. These monitors are calibrated using CO, not electronic guesswork! Ask your NCI-Certified Contractor how an NSI 3000 Monitor can help keep your home safe and healthy today! Why do I need a low-level monitor? The NSI low level monitor senses CO levels as low as 5 ppm (parts per million). Infants, children, elderly, persons with respiratory or heart ailments are provided little or no protection from deadly CO with standard alarms. Longterm exposure to Low-level CO above 15 ppm can cause illness and even permanent disabilities. What about the other "detectors" sold at retailers and home centers? Store-bought detectors don't alarm until unsafe levels of 70 ppm or higher are present at the unit for 3-1/2 hours! By then it may be too late. Plug-in models don't always allow for proper placement and don't work during power outages. The NSI 3000 is battery powered for 24/7 protection. Why is the NSI 3000 more expensive than the others? Accurate, low-level CO detection requires more expensive components & quality control. The NSI 3000 CO monitor uses the same technology and sensors as in professional-grade CO analyzers used by contractors, fire departments, and utilities.And NSI's unique Continuous Scan mode lets you know the monitor is operational 24/7! How many monitors should I have in my home? As with smoke detectors, you should have one monitor installed on every level of your home. Even a single story home may need two; one at each end. Where should I place the NSI monitor? CO is lighter than air. Monitors should be mounted at eye level and no lower. They should be placed in an area with good air circulation. If you have only one monitor it should be placed near the master bedroom. 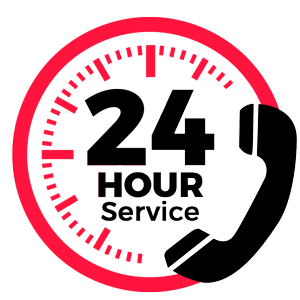 Additional locations include your kitchen, nursery, basement, rooms with fireplaces or gas logs, and near your heating system and/or hot water tank.Your professional installation contractor will determine the best location in your home. What should I do if my monitor goes off? Call your CO-Certified contractor at any level below 70 ppm, unless you have symptoms. CO exposure can cause nausea, severe headache, shortness of breath, chest pain, blurred vision, and dizziness. If you experience these symptoms call 911 and leave the house immediately. Above 70ppm, evacuate immediately. If you have symptoms, call 911 from a neighbors house. Call your utility to turn off the equipment until your CO Certified contractor can investigate the source of carbon monoxide. Lets you know there’s a problem before reaching dangerous, even deadly CO levels, long before the other detectors even begin to work. NSI’s Model 3000 Monitors employ the same electrochemical sensor technology found in professional CO Analyzers that cost thousands of dollars. These monitors are calibrated using CO, not electronic guesswork! The NSI low level monitor senses CO levels as low as 5 ppm (parts per million). Infants, children, elderly, persons with respiratory or heart ailments are provided little or no protection from deadly CO with standard alarms. Long term exposure to Low-level CO above 15 ppm can cause illness and even permanent disabilities. What about the other “detectors” sold at retailers and home centers? Store-bought detectors don’t alarm until unsafe levels of 70 ppm or higher are present at the unit for 3-1/2 hours! By then it may be too late. Plug-in models don’t always allow for proper placement and don’t work during power outages. The NSI 3000 is battery powered for 24/7 protection. Accurate, low-level CO detection requires more expensive components & quality control. The NSI 3000 CO monitor uses the same technology and sensors as in professional-grade CO analyzers used by contractors, fire departments, and utilities.And NSI’s unique Continuous Scan™ mode lets you know the monitor is operational 24/7! As with smoke detectors, you should have one monitor installed on every level of your home. Even a single story home may need two, one at each end. Call your CO-Certified contractor at any level below 70 ppm, unless you have symptoms. CO exposure can cause nausea, severe headache, shortness of breath, chest pain, blurred vision, and dizziness. If you experience these symptoms call 911 and leave the house immediately. Above 70ppm, evacuate immediately. If you have symptoms, call 911 from a neighbors house. Call your utility to turn off the equipment until your COCertified contractor can investigate the source of carbon monoxide. Carbon Monoxide is the #1 cause of poisonings in the U.S. Yet less than 5% of all CO Poisonings are reported! The safe and efficient operation of your heating equipment and other combustion appliances cannot be determined without testing using a calibrated combustion analyzer. Because the technology, instruments and training to do this testing correctly has only been available for a few years, odds are it’s never been done. Your service technician should be certified to properly test and diagnose potential CO exposure. It’s About Your Health, Safety and Comfort Carbon monoxide, even in small quantities can cause serious health problems, particularly in children and the elderly. Millions of unsuspecting homeowners are exposed to low levels of CO and don’t even know it. Unfortunately U.L. Listed CO alarms don’t go off until your family has been exposed to 70 ppm (parts per million) for over 3-1/2 hours! Most international limits for unsafe levels, including OSHA and the World Health Organization’s guidelines are between at 15-35 ppm. Carbon monoxide can come from additional sources in your home besides your heating equipment, and they should be checked. These sources include your Water Heater, Gas Range, Gas Logs, Space Heater, Boiler – even an attached garage. Anytime equipment is installed, it’s being exposed to conditions in which it has never been tested to perform. Venting systems, combustion air, duct systems, additional appliances in the building, building pressure etc., can all affect its operation. Besides that, after leaving the factory it’s likely your equipment has been loaded and unloaded on trucks and transported several times. Vibration and shock can cause components to shift and move. The only way to truly know if your new equipment is operating safely and efficiently is to test it once it’s been installed. Better Contractors Don’t Guess - They Measure If CO testing is part of your Contractor’s normal protocols he will advise you of this prior to servicing or installing equipment. Odds are when the tech walks into you house he’ll be carrying some type of CO Monitor to immediately check if unsafe CO levels are present. When working on the equipment, he will likely drill a hole in the flue of the appliance, and insert the probe of an electronic combustion analyzer to check actual burner performance. Additional performance testing might require holes to be drilled into the ductwork as well. Once he’s finished testing he should provide documentation and review his results with you. QUESTION: I have a CO alarm in my house, shouldn’t this warn me if there is a problem? ANSWER: If you purchased your alarm from a store, it will usually only warn you of a life threatening condition. If you read the fine print on the product’s UL listing, you’ll find it offers little protection for children, the elderly, or persons with existing illnesses or CO sensitivity. QUESTION: What level of carbon monoxide can be harmful? ANSWER: According to the World Health Organization, 15-20 ppm is the first level of CO that can affect us. Levels as low as 30 ppm have been discovered to cause heart problems. Store CO alarms do not have to activate until they see 70 ppm for 3-1/2 hours! QUESTION: What type of alarm should I have then? ANSWER: Ask your contractor for a low-level monitor that alerts you at levels beginning at 15 ppm. Make sure it’s battery operated and visually tells you it’s working 24/7. QUESTION: Can’t I just call my gas company if I think I have a problem? ANSWER: Would you call the gas station if you had a problem with your car? Gas companies are well versed in fuel leaks, but their main business is not appliance service and few of them are Certified CO/Combustion Analysts. QUESTION: How do I know if my contractor is a Certified CO/Combustion Analyst? ANSWER: You can ask to see his NCI wallet card, plus you will recognize his level of expertise and ability to explain to you what he is doing. As a consumer you should expect your contractor to be trained in current technology that makes sure you’re heating system is safe, comfortable and efficient. These are probably things you may expect are mandatory, but unfortunately they’re not. The number one benefit of having an NCI Certified CO/Combustion Analyst test your home and appliances for carbon monoxide is his extensive training and knowledge. Your contractor should be trained to measure the safety and efficiency of all your combustion equipment, even appliances that he doesn’t normally sell or service. Thorough testing can also verify that your equipment is operating at peak efficiency and provide the lowest operating costs. Finally, he should provide you with documentation that explains what he has found and what corrections have been or need to be performed. He should also provide you with material to better educate you about carbon monoxide sources and health effects. Provides protection for all age groups and conditions, especially infants, children, the elderly, and highly sensitive or ill people. Other detectors barely provide minimal protection for healthy adults. Click Here for More Information on the NSI 3000 Low-Level CO Monitor.